It can be shown that in the presence of a toroidal magnetic field induced by poloidal coils, combined with the electromagnetic field induced by a central solenoid, no static equilibrium is possible within the MHD description, as soon as non-zero resistivity is assumed. The resulting dynamic equilibrium was previously discussed for the case of spatially homogeneous resisitivity. In the present work, it is shown how a spatial inhomogeneity of the viscosity and resisitivity coefficients influences this equilibrium. 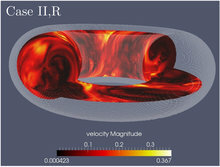 Parameters in both the stable, tokamak-like regime and unstable, reversed field pinch-like regime are considered. It is shown that, whereas the magnitudes of the velocity and magnetic field fluctuations are strongly modified by the spatial variation of the transport coefficients, the qualitative flow behaviour remains largely unaffected.